In a follow up to the articles we published on fuel transfer pumps and tanks, we thought it would be a good idea to dive in and take a look at how you actually install one of these set ups. While the earlier articles did touch upon the installation, the focus was more on reviewing the individual products, rather than the nuts and bolts of attaching one to your vehicle. So, in the following 10 easy steps we aim to give the lowdown on how to get started with your new fuel transfer tank. First things first, (and hopefully you have looked into this before making your purchase), you need to have sufficient room to fit the new tank. The most common area is the flatbed of your truck. Before you get started, you should remove all unwanted items and clean the space ready for the tank. If your truck has a bed mat you will need to remove this too. Fuel transfer tanks designed for trucks are heavy. And that’s before you’ve even put any diesel in it. Trying to install the tank on your own is fast ticket to back pain. Call up a friend with the promise of a couple of cold ones at the end of it, and share the weight of the task in hand. Lifting the tank between two people should not be a strain at all. 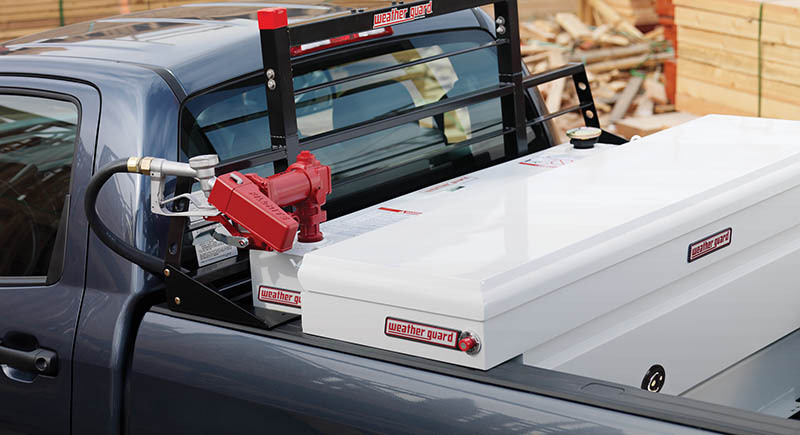 With the help of your friend you now place the tank on the truck in the desired position. Then, mark the points where the mount sections of the tank will be fastened to the truck. This will require an electric drill of course, so make sure batteries are charged, or that a mains outlet is close by. Using your marked points as your guide, you now drill into the truck bed using the correct size drill piece for the bolts that came with your tank. (If bolts didn’t come with your tank, we recommend using galvanized bolts about half inch in size). A 9 by 16 inch bit should be the right size for the job; check the specifications of your tank before you drill however. Slide the bolts through the flanges of the tank and into the drilled holes. The bolts should be fixed from the underside of the truck so that everything looks neat and tidy. Use a wrench to ensure everything is tight. Inside the tank pump you should find a filter. You will need this before filling up the tank. After locating the filter, use a wrench to loosen the filter screw so that you can remove the filter from the tank. Now you will need to fill the filter with diesel. Once the filter is full, place it back in the tank, inside the designated filter slot and tighten in place. Before you crack open the beers with your buddy, you need to fill up the tank at the gas station. You want to make sure it is working as it should don’t you? Once you have finished filling up the tank, you need to put the fuel cap back on. Then, when it comes time to transfer fuel you will need to turn on the pump located at the top of the tank. And that’s it. Well done. If you have some transferring to do, ensure the pump is switched on and press the lever to begin the process. (Remember to turn off the fuel pump after you have finished however). Otherwise, celebrate your hard work with the cold ones you promised your friend. (And do not step anywhere near your vehicle or transfer pump tank after you’ve had a few).